As an amateur bargain hunter I pride myself on my thrift shopping ability. I have friends without the patience to dig, including those who turn their nose up at buying second hand items, but I love the thrill of the hunt. I have an overflowing closet full of vintage shoes, dresses and accessories that make all that digging time worth it. I tend to avoid the bigger thrift shop warehouses around the city, opting instead for smaller, one-off charitable shops that aren’t too overwhelming. 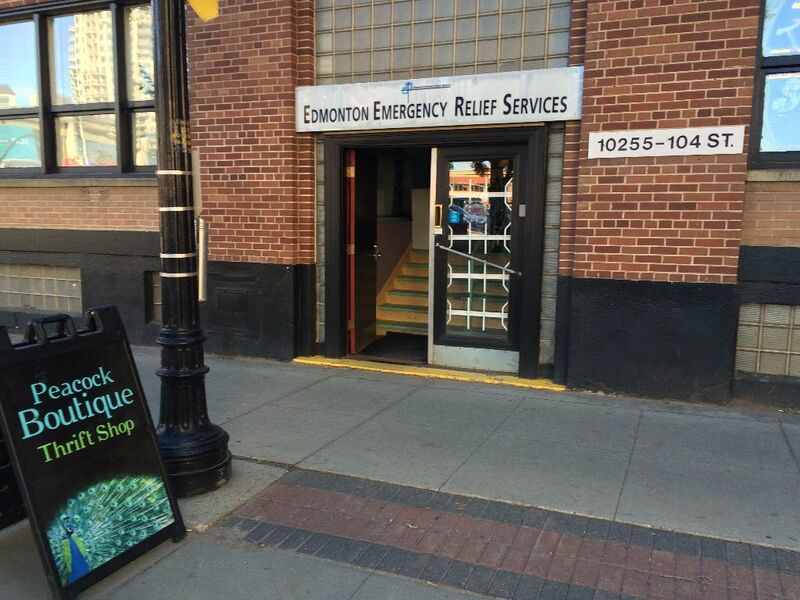 This summer I finally walked into the Edmonton Emergency Relief Services‘s Peacock Thrift Shop downtown on 104th street. While I sometimes keep my thrift shop sources on the down low – I enjoyed the Peacock Thrift shop so much I wanted to spread the word, especially after I learned that the EERS works with the Canadian Red Cross locally by providing household furnishings, household goods, clothing, and personal goods for individuals and families left homeless after fire or natural disaster. The place is decorated with some pretty cool vintage items including a cigarette machine, record players, and retro washing machines. The shop is conveniently separated into sections including a mock kitchen. I found myself an angel food cook and some cheesecake pans – all looked like they had never been used. The furniture room was filled with some cool vintage pieces at great prices. There was also a new and used toy section. I breezed through the clothing because I was short on time, but I could see some fun pieces if you had the time to search. I did cash in on a few accessories, scoring in the 4 belts for $1 box, and picking up a couple of brooches (including one that my friend borrowed to wear in her hair for her wedding). Even though the Edmonton Emergency Relief Services has been selling new and second hand items at the Peacock Boutique Thrift Shop for years, I was amazed to find such a gem in the downtown core. The prices are great and shopping is always more fun when your purchase goes to support a great community partner.